We’d love your help. Let us know what’s wrong with this preview of The Norton Anthology of Modern Poetry by Richard Ellmann. Works by American and British writers illuminate the development of modern poetry. 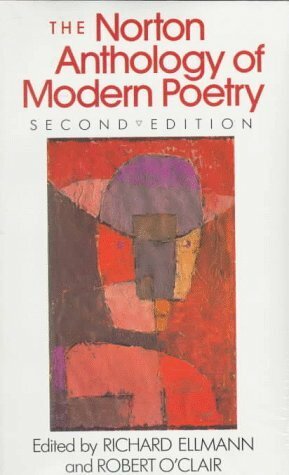 To ask other readers questions about The Norton Anthology of Modern Poetry, please sign up. Welcome to the graveyard of forgotten poets. About half of these poets have been obliterated from discussions, another third hangs on as historically important, and about 20% heralded as Ist-icons of other some -Ism. Although Norton has selected a number of the most topical and respected poets of the early twentieth century, and some late twentieth, the book is only worth having because it has so many poems in it. If you like poetry, own a Norton. By the way, nobody "reads" this book. They wend t Welcome to the graveyard of forgotten poets. About half of these poets have been obliterated from discussions, another third hangs on as historically important, and about 20% heralded as Ist-icons of other some -Ism. Although Norton has selected a number of the most topical and respected poets of the early twentieth century, and some late twentieth, the book is only worth having because it has so many poems in it. If you like poetry, own a Norton. This sucker helped me breeze through the modernist stuff on the lit test. It's got enough biographical info and info about how critics classify the poets to help you remember the difference between similar dudes (and dudettes), and most of the poems are exemplary of their styles. A great primer, and a great book to have if you don't plan on buying volumes and volumes of modernist poems! Right now (9/11/07), it's Whitman, Dickinson, and the intro. Soon it'll be Eliot, Pound, Stevens, Williams, etc. Now (9/13/07) it's time for 55 pages of micro-sized print William Butler Yeats. Oh boy. I may never actually finish this book as it's an anthology, I pick it up every once in a while to re-read favorite poems that are included and new ones I haven't encountered yet. This is an outstanding collection. Love the Walt Whitman poems. This is a bookshelf basic as far as I'm concerned. Awesome awesome selection. Cannot rate it highly enough. Just open anywhere and learn something! Ok, obviously I haven't read the WHOLE thing, but it's on my shelf. Oh, Norton, how I love thee. These anthologies are awesome--both for the great works they include and for the interesting information about authors. Norton, Norton, pudding and pie. I did not read this cover to cover but probably read the biographical information and all the selected works for about 1/3 of the authors (about 450 pages of poetry). Okay, truth be told I do not like much modern poetry. A few years ago after on of my long recoveries from surgery, I went through this anthology to see if any poets appealed to me that I might want to read further. There were a few, also a few I liked a lot, but I still like the older poets better. This is a book for your library that you constantly refer back to, that helps introduce you to some of the greatest poet living and dead. I am so thankful my Poetry Writing Prof made us buy this. Shoutout to John Matthias at the University of Notre Dame. I will always be currently reading this book. Bought it in college, still the best one anthology I've got -- and written all over!